Many of you may know that my sister is a lion conservationist in Kenya. I went out there just before Christmas to spend time with friends and family – and one of the things I did was to organise a Teambuilding day for her staff. Below my account of the day. Samburu had never seen rain like this before! Everything was lush and green – so different to the last time I was here – when the rains had not arrived, the land was red and dusty, and the animals lethargic from thirst and fatigue. This time the Ewaso Nyiro was flowing at full pelt, Samburu’s only hippo was relishing his time in the cool waters, the elephants were relaxed, happy, well-fed and enjoying wallowing in the river. Samburu was happy. So what better time to have Tenebo Day, Ewaso Lions Teambuilding Day. 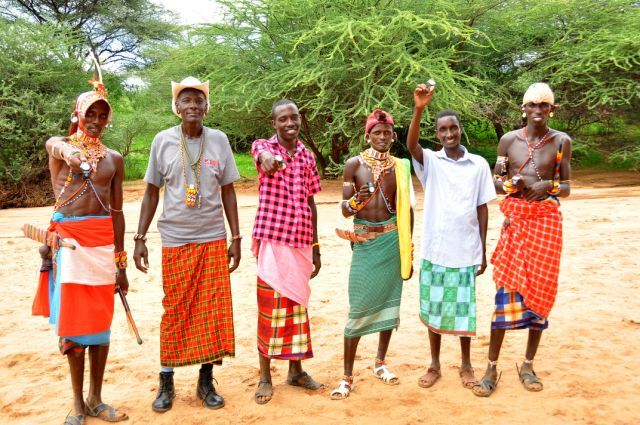 Tenebo means Together in Samburu – and that’s what we wanted to achieve on this day – bringing all the field staff, Lion Scouts, camp staff, plus members of the Warrior Watch programme together to do activities that would get them thinking, talking, laughing, engaging. I was fortunate to be visiting my sister Shivani in Kenya for a couple of weeks – and so had agreed to organise all the activities for Tenebo day – and came up with some old favourites (such as tug-of-war) that I knew the teams had done in previous years – but I also wanted to try some new things out. 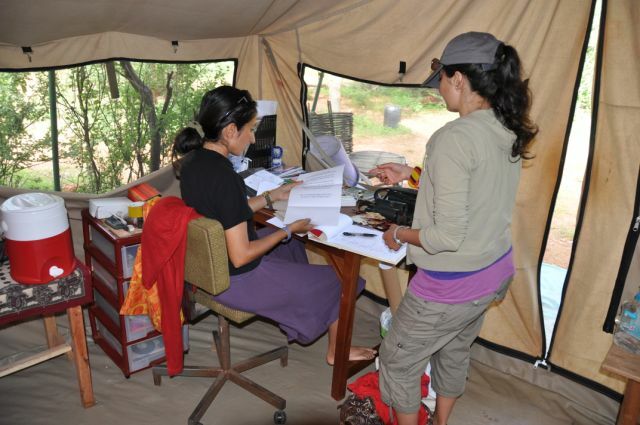 The day dawned warm and bright, and Shivani and I left for the nearby lugga to set up before the teams arrived. Back at camp, people were beginning to arrive and were met with a warm welcome and a hot cup of sweet chai. Then, they made their way to the lugga for a day that had a mixture of physical and mental tasks to challenge the teams in various ways. Sports Day included simple races such as three-legged race, potato and spoon race (blindfolded) and sack race causing much hilarity and bringing out the competitiveness in the teams. Round the Table included activities such as threading a needle, putting a deck of cards in number order and making the longest word from a set of nine letters. But, perhaps the most successful activity in this section was the small mini animal jigsaw puzzles that the teams had to solve. Most children in the west have grown up seeing a jigsaw puzzle at some point in their lives. Most of the Ewaso Lions team had never seen one. So, to explain to them what it was, show them how to put one together and then watch as they painstakingly put one together with the help of their teammates, brows furrowed in concentration, quietly whispering – was quite fascinating! Treasure Hunt was quite a tough activity for the teams to understand to begin with, but by the last clue – everyone had got the hang of it – and once again this was a hugely competitive activity. Each team was given the clue below – in English, and it was then translated to them by their team leader who then sent one of his team members to find the item being described. Can you tell us what items you think the teams were looking for – and where they were hidden? Golf is a game that I take for granted, seeing that my partner manages a golf club – and I grew up with friends and family playing golf all the time. But, when the teams saw the golf clubs and balls we produced, they couldn’t understand what these were. This proved to be the hardest activity of all. Each team had 5 people and each person had a chance to knock the ball into a small sunken can in the ground. Not one person was able to achieve this – and this included Shivani and me. Some people whacked the ball so it went flying, and some people were too timid. It did however get them thinking and intrigued – and the golf clubs and balls are now back at the Ewaso Lions camp where we hope the team are working on their putting skills! Tug-of War is an old favourite – which really shows how strong the Samburu people are. Each team didn’t want lose – and boy did we see some determination! From one moment to the next the atmosphere changed – from utter chaos and laughter, to pin drop silent concentration. But whatever the activity, the teams gave it their all – and getting them thinking, talking, laughing and engaging had been no effort at all – the sign of a committed, strong and dedicated team.